Seeing the oddly wet crumbling stone statue of the dwarf god, Ander, Audrey and Broak all moved in to inspect in closer. Without warning, a slimey stone-grey blob whipped out towards Audrey, but she managed to duck clear. They found themselves confronting a grey ooze laying in wait on the statue. Battling the ooze, Broak landed a blow on the amorphous blob, only to pull his warhammer back, it's head smoking and hissing from the creature's acids. The others struck from afar and, in an attempt to get some distance, Broak stepped away only to be attacked by the ooze. The attack left parts of chain mail ruined. In the end, Audrey manages to drive her torch into the blob and finish it off. 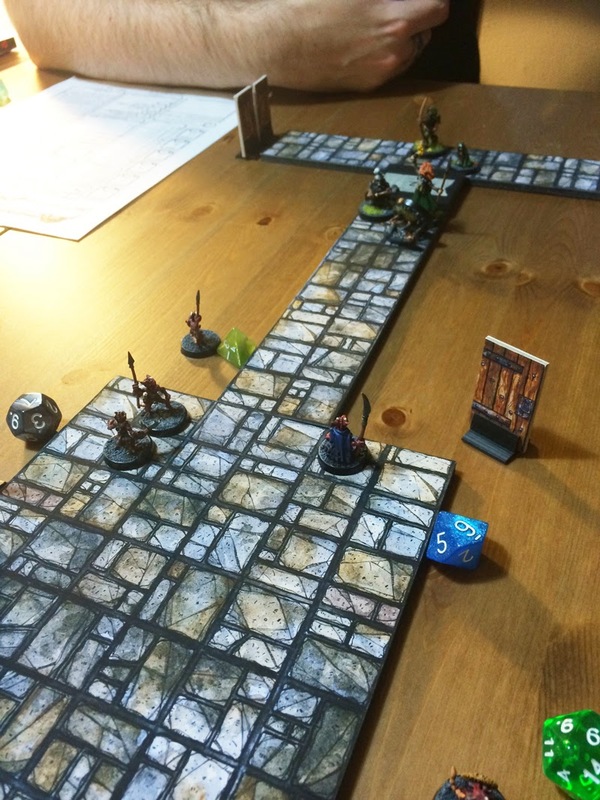 To the north the party found a small hall that ended in a small room, with its only exit being a crudley bricked up doorway—they need to find someway to smash it down, or another way through. Heading back where they came from they decided to head to the passage to the east, a long corridor ending in a T-junction. 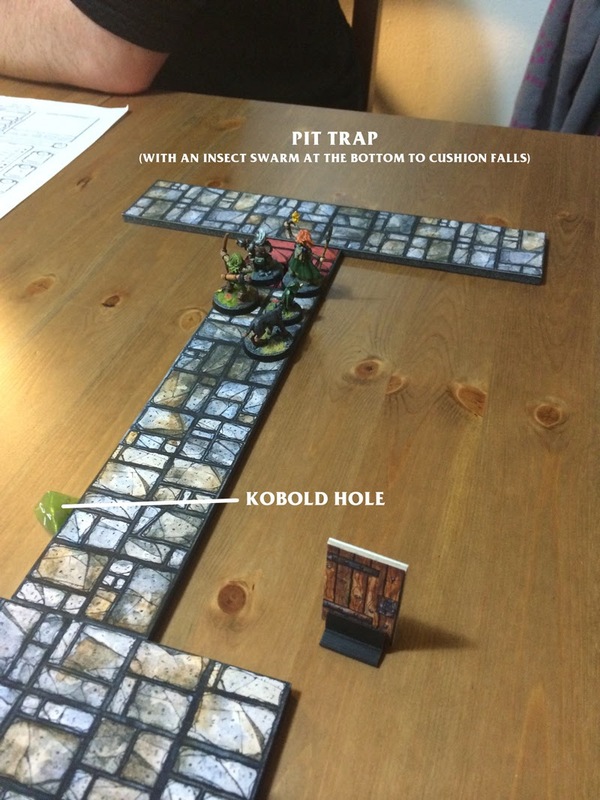 Broak and Audrey led the party down the corridor, passing a kobold hole in the northern wall. As they went Audrey tapped the flagstone floor with her halberd in hopes of finding any traps—luckily she had Broak with her. As the two moved closer to the junction, the flagstones gave out beneath them, revealing a 10 foot pit. Audrey managed to jump back in time, but Broak—in classic Broak fashion—rolled a 1 (but a heroic 1). He fell flat into the pit, occupied only by some scattered coins, a human skeleton and some kobold skeletons... and that's when he noticed the insect swarm. Working quickly, Audrey began throwing down a rope to help her hapless, insect-covered dwarf companion. This commotion of course attracted a team of kobolds to the area. They could hear the yapping creatures making their way through their tunnels towards them. While Audrey rushed to pull Broak up, Ander and Grabby edged their way to the opposite side of the pit to get some distance from the oncoming kobolds and search for some oil to douse the swarm of insects. Soon enough, the kobolds were popping out from around the corners and out of their holes to whip sling stones at the party. With Broak still in the pit and Ander and Grabby too far away, their only targets were Audrey and the ever-faithful Bloo, Ander's war dog. Bloo was struck in the head by a stone dropping him like a sack of puppies (he was still alice, just unconcious). Audrey, with her back turned and unable to move around, was struck by another stone but managed to keep her hold on the rope to help Broak up. Clambering out of the pit, Broak was still being pursued by the writhing black mass of biting and stinging insects. Ander was able to fell a few kobolds with his long bow as they sprang out from cover to attack (a nice change of pace for Ander). Audrey made her way to the other side to join her other two companions, who were now rifling through Ander's pack to find some oil (Grabby decided to swipe some chalk out of Ander's pack while he was distracted with riddling kobolds with arrows). Grabby then doused the edge of the pit with oil and waited for Broak to cross. Seeing his chance for heroism, Broak hurled his shield and war hammer across the pit (his shield wound up falling into the pit), scooped up Bloo and edged across to the other side with the insects swarming after them. Just in time, Grabby set a torch to the oil as the insects scurried through it (and Broak's warhammer also happened to be in the oil), and the party eventually stomped and bashed their way to victory, killing the swarm. It was a successful evening: Ander was actually hitting targets, Broak never dropped to less than zero hit points (and he got to save a dog), Audrey got to help a dwarf, and Grabby managed to steal a piece of chalk from his friend.